As the Grand Excursionists steamed above Hastings, in 1854, they neared the end of their trip and the end of the Mississippi River most people know. That Mississippi is a river of wooded islands, braided channels, backwater lakes and sloughs and a broad valley  the river of Mark Twain. It begins in St. Paul and ends at the Gulf of Mexico. Above St. Paul, above the mouth of the Minnesota River, a very different Mississippi begins. The reach from Pine Bend through St. Paul is one of striking contrast and is entirely within Minnesota. Natural beauty intermingles with heavy industry and dense urban development. Pine Bend, like Nininger, began with grand hopes that disappeared after the Civil War, as the railroads bypassed it. In 2002 the Minnesota Department of Natural Resources (DNR) acquired 160 acres to establish the Pine Bend Scientific and Natural Area. Until 1930, when Lock and Dam 2 submerged part of it, Grey Cloud Island was one island. Today Upper and Lower Grey Cloud Island lie across from Pine Bend. The islands are named for Ma-Hpe-Ya-Ho-Ta Win, or Grey Cloud Woman, who was the wife of Hazen Mooers, an American fur trader. The island once supported the village of Medicine Bottle, a Dakota leader who convinced some lodges of the Dakota to separate from Little Crows first village of Kaposia, just upstream. Today, Aggregate Industries operates a sand-and-gravel pit on the lower island. Barges towing these materials to terminals upstream account for much of the commercial shipping in the Twin Cities area. Behind Lower Grey Cloud Island, in Cottage Grove (pop. 30,582), lies the Grey Cloud Dunes Scientific and Natural Area, a gift from Ashland Inc. Southwesterly winds, blowing over two sandy terraces, form dunes 10 to 20 feet high populated by prairie dropseed, sand reed grass, silky prairie clover, sea-beach needlegrass, longbearded hawkweed, blue racers (a rare snake) and prairie skinks. Above the islands, the river narrows and the modern Grand Excursionists will run past St. Paul Park (pop. 5,070) and Newport (pop. 3,715) on the east, and Inver Grove Heights (pop. 29,751) on the west. Upriver from Inver Grove the original excursionists would have steamed by the remains of the second Dakota village named Kaposia. The Dakota had moved the village there in 1834, but in May 1854, shortly before the Grand Excursion arrived, the United States forced the tribe to move to a reservation up the Minnesota River near Redwood, Minn. Today, the village is called South St. Paul (pop. 20,167). South St. Paul is probably most famous for its meat packing history. In January 1888, the stockyard opened and by the early 1900s Swift, Armour, Cudahy and Wilson  four of the nations five leading meat packers  had located there. By the 1960s, the stockyards and associated operations began declining, as the business decentralized. Just past the stockyards, the Mississippi Valley quickly broadens. To the east the Pigs Eye Lake backwaters and floodplain once supported a large forest and Kaposia I. To the west St. Pauls downtown airport (Holman Field), lies atop a former floodplain prairie, wetlands and Lamprey Lake. Less than 100 years ago, a moderate flood would have extended from bluff to bluff here, over two miles wide. At the lower end of Pigs Eye Lake the river forks, one branch leading through the navigation channel and the other past a large barge fleeting area, the Red Rock Industrial Park, and into Pigs Eye Lake. Both channels pass Pigs Eye Island No. 2, home to a large heron and egret rookery. Eagles also nest here. Barge Terminal No. 1 lies just above the rookery. Various companies handle petroleum coke, grain, sand and gravel, caustic soda, scrap metal, salt, and glycol (anti-freeze) at the terminal. Minneapolis and St. Paul opened the first sewage treatment plant on the Upper Mississippi River at Pigs Eye in 1938. The colorful name comes from a colorful character, Pigs Eye Parrant, a one-eyed whiskey seller and one of St. Pauls earliest residents. Parrant, like many early settlers, originally built a cabin near Fort Snelling. In 1837, the forts commandant forced the squatters out, and Parrant soon landed at the site of St. Paul. From 1839 until 1841, when Father Lucien Galtier erected his chapel of St. Paul, residents called the settlement Pigs Eye. 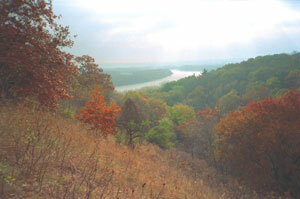 Daytons Bluff rises some 200 feet above the Pigs Eye floodplain, offering a spectacular vista. The Hopewell people buried their dead in large mounds on top of the bluff nearly 2,000 years ago. At the bluffs base, an underground stream hollowed out a large cave that the Dakota called Wakan Tipi, or house of spirits. In 1766 when English colonist Jonathan Carver entered the cave, he found a series of snake figures and a bear etched into the ceiling. Today the cave is sealed. In 2002, St. Paul bought 27 acres of land between Daytons Bluff and downtown St. Paul to create the Bruce Vento Nature Sanctuary, in honor of the late congressman. Once part of the Phalen Creek delta, early settlers filled the creek and surrounding wetlands for an extensive railroad yard. The city, in cooperation with local neighborhoods and public agencies, is restoring the site by removing contaminated soils and exotic species and planting native species. Rounding past Daytons Bluff, the Mississippi turns almost 90 degrees to the west, and St. Paul (pop. 287,000) rises from the lowlands of Phalen Creek. Capturing the best landing at the top of the large floodplain river, St. Paul became the Mississippis head of navigation. This is why the Grand Excursions steamboats stopped at St. Paul, turning their passengers loose among the surprised residents, on June 8, 1854. St. Pauls population quickly grew away from the river. Over the last decade, St. Paul has returned to its river origins, revitalizing parks, rebuilding its old steamboat landing, constructing a public dock and bringing a showboat to Harriet Island.